Rokinon posted a not-so-subtle hint at their upcoming Xeen product line to their Facebook page earlier today. The photo shows a Xeen branded pirate ship blasting a Zeiss CP.2 and Canon CN-E out of the water. Not much mincing of words there. I’ve had some hands on time with this new product and I have to say, I’m impressed. Let’s discuss a few minor details first. I’m not a huge fan of the name. “Xeen” sounds way too similar to another target competitor, the Xenon FF primes from Schneider. I’m not really sure what the story is behind this name and where it came from but I’m told by inside sources that it’s still better than other proposed names. Maybe it will grow on me. Maybe… The next order of business: let’s get this out of the way right now. Yes – these are the same optical design as the Rokinon Cine DS lenses. Yes, the Rokinon Cine DS lenses share their optical design with the older “non-DS”. Yes, Samyang is the OEM for Rokinon. Yes, Samyang used to offer the same still photo lenses under a variety of brands. Satisfied?! There are a lot more details that we’ll be going into in the coming weeks with a deep look into the Rokinon brand and the products they offer. Check back soon for that. Until then: Onward with Xeen. The new Xeen primes will begin shipping in August with a 24mm T1.5, 50mm T1.5, and 85mm T1.5. The lenses have an all aluminum alloy body with your pick of Arri PL, Canon EF, Nikon F, Sony E, or Micro 4/3. All the lenses will have a common 114mm front diameter and identical focus and iris gear positions for speedy lens swaps. The aperture will be a nice 11-bladed iris. The focus barrell is laid out with plenty of nicely spaced, clearly readable distance marks and about 200 degrees of rotation. Each lens weight will vary a bit based on the design but will all be around 2.5 lbs. Coverage on these first three primes will be an impressive 35mm full frame (that’s Vista Vision 8K for those of you who only speak Red). I haven’t tested these on a Red Weapon just yet – the wides may not cover entirely, but I’ve been pleased with the results on similar sized sensors already. 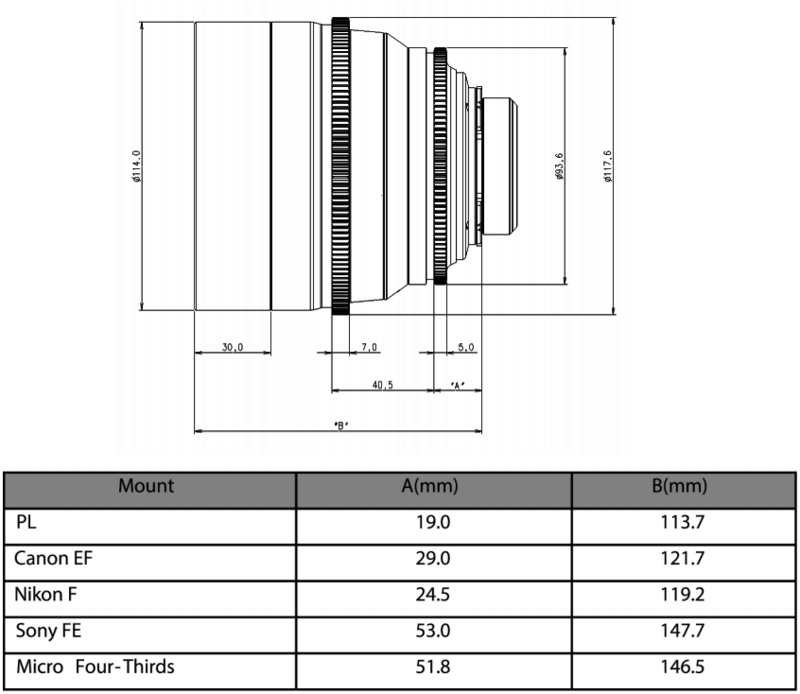 When Canon released their CN-E primes they began by shipping just the 24mm, 50mm, and 85mm. Schneider began their Xenon FF line with a 35mm, 50mm, and 75mm. I’ve said it before and unfortunately I have to say it again… Three lenses does not constitute a cinema lens “set”. I was disappointed when Rokinon informed me that the Xeen lenses would initially only be three lenses. That said – I’ve been promised a complete line of Xeen cinema primes in the very near future. I don’t know exactly which focal lengths they plan to port over from the Cine DS line, but with any luck, we could potentially be looking at a set consisting of a 12mm T3.1 Fisheye, 14mm T3.1, 24mm T1.5, 35mm T1.5, 50mm T1.5, 85mm T1.5, 100mm T3.1 Macro, and a 135mm T2.2. There are even a few other focal lengths that could be utilized from the Cine DS line such as the 16mm T2.2 or the 10mm T3.1 Fisheye. However, these aren’t designed for 35mm Full Frame, but rather Super 35 (APS-C). Not a deal breaker but it would mess with the flow of this otherwise 35mm Full Frame set. Excellent, circular iris at all stops. I had a good amount of time to play with the new Xeen primes over the past few weeks and I do have to say I’m quite impressed. I’ve known for years that the quality of lenses coming out of South Korea was padded, maybe even sandbagged, intentionally or otherwise, and that the potential for a properly designed and manufactured product was well within reach. The Xeen lenses are just that – a well made lens. The barrels are all very well machined and finished. The PL mount is a proper stainless steel. Even the shims are laser etched brass and/or steel. The hardware is all very nice. The focus and iris movement are butter smooth with just the right amount of resistance. The optics are just what most would expect. It’s identical to all the other Rokinon Cine Primes with the exception of the coatings. Rokinon does boast a newer, better advanced 14 layer anti-reflective multi-coating to suppress flares and control aberrations. If you’ve tried the other Rokinon lenses in the past and you were happy with the performance, then you’ll definitely be happy with these. If you tried the Rokinon primes before and weren’t impressed with the image quality, give these a try and you may find that their new coatings take them up a notch. All this to say, yes… The Xeen lenses are an absolute bargain at $2,500 each. You simply can’t argue with that price tag. Or maybe you can but that’s your fault for expecting Master Prime quality out of a lens with a $2.5k price tag. Don’t get greedy. To me, this isn’t about how low the price bar can go or how debated the image quality of these lenses will be. To me it’s about innovation. Rokinon really isn’t doing anything new here. They deserve no credit beyond meeting the basic demands that the motion picture industry put in place decades ago: consistent, fast, reliable prime lenses… It’s not difficult. And yet, the cinema lens market has been flooded with mediocre products that cater to the YouTube review generation. The Xeen lenses are a shot over the bow of all the other lens manufacturers. It’s time to stop the price war and focus on true innovation. It’s time to put the cinematographer ahead of the profit margin. There’s a place in this ever-evolving industry for an entry level prime lens like the Xeen and there’s a summer blockbuster feature film set where a top of the line precision optic belongs. So go ahead, put a $20,000 price tag on your flagship prime lens, but you’d better make it damn good. I’m a regular preacher of my “Cine Lens Compromise” theory in which the balance between optical performance, mechanical performance, and price is easily determined. Some of which is simply the laws of physics. To raise the level of optical and mechanical performance to the max, the price must lawfully follow. Simple as that. The Xeen lenses just set that bar for the rest of the industry. So now the question on everyone’s mind – how do these compare to the Zeiss CP.2, the Canon CN-E and the Xenon FF? I’ll have an extensive comparison coming very soon. Subscribe!Until then, if you’re convinced, you can Duclos Lenses – Rokinon Xeen Cinema Primes. Oh, and no, there’s not a six month wait. They’ll be shipping immediately. However, quantities are limited – so I wouldn’t take too long to decide. No one expects Master Prime performance for this kind of money. But I would have expected more than rehoused and recoated pretty cheap stills glass, and I would especially have expected an optically reworked 24mm, given how poorly most people felt it performed. Maybe the new coating will help, but I doubt it. And, if they are serious about this business (and they must be, if they expect people to pay $12.5k+ for a set) they need a good fast wide; they need to build that 18mm T1.5 to fill out the range. I highly doubt that they’ll engineer new optical designs just for this set. At least not in the immediate future. From my point of view, this product is ideal for a lot of budding cinematographers. The most common question I get about the Rokinon primes is “Can I get it in a PL mount?”. Similarly, I often hear customers say that $4,000 or $5,000 is too much for a Canon CN-E or a Zeiss CP.2. Now there’s an option for a proper cinema housing with PL mount, at half the price of similar options. As I said in the article, this isn’t about how much you like or dislike the Rokinon Cine DS lenses and their optical performance – it’s a testament to what is possible and at what cost. If you’re oriented firmly towards full-frame shooting, it’s a lot more appealing propositionI think; there’s less competition (CP.2, Xenon, & CN-E at nearly twice the price) and the lack of an 18mm with consistent T-stop is a lot less of an issue. If – as most of the business still is – you’re oriented to S35… well, your competition includes good used sets too, and at $12.5k+ for a set, you’re well within range of the price of a good used set of RPPs or new CineAltas, maybe even the Mk. 1 Xenars if you can live with the funky ergonomics. I’ll be very interested to see how these stack up against RPPs and CineAltas performance-wise; they’re very comparable on price. Actually, you get 6 lenses in the CineAlta set for $12,900. If the price of $2,500 per Rokinon is to stay the same for their next 3 offerings whenever they become available, you’d still be spending an additional $2,100 over what’s available right now from Sony, which have a constant t/2 across their range. My assistant goes nuts with still glass. Almost unworkable in a lot of situations. I have a set of DS primes that I use when operating myself, but having a cinema lens with properly spaced focus marks and 200 degrees of rotation for your AC will make a huge difference for projects that need critical focus at all times. Well for me its an easy choice. I live in France, the CP2(T2.1) are listed at 2970€ wich put them most of the time somewhere around 2700euros without taxes once you get a small rebate. Back then in time, when the CP2 went out, the dollar was cheap, 1€=1,40$ so their price tag went somewhere aroud 4000$in the US. So basically it makes the rokinon Xeen lenses around 2500€ each, so how would they expect us to buy a cheap glass rehoused instead of a nice and sharp CP2 that would cost a few euros more?? The only reason i would go for a Xeen set would be if they offer some kind of really special look, like a lot of flare or an “anamorphic” bokeh, other wise i will stick with my VDSLR version. As one that’s thinking of moving up from a still lens used for video to a true cine-style lens, I was disappointed that the barrel rotation is only 200 degrees. Should I be? Might have missed it, easily interchangeable mount? EF to PL and back again like CP.2’s? Doesnt look like it so far. 2.5 lbs puts them just under Leica S weight and half the mass of Sony’s cine alta. For gimbal ops and handheld this spec is most welcome. I look forward to reading your review, which I hope will include a direct comparison between CP2’s. The price almost makes the XEEN Primes disposable! Samyang Management has seriously mis-stepped because these lenses are doomed at this price point. Filmmakers buy Samyang/Rokinon when they cannot afford Zeiss ZE’s or ZF’s. There’s simply no market for expensive cine rehoused lenses from this manufacturer. I thought the same, the price point was just a little *too* high, given that they *are* basically rehouse jobs. You’re paying for R&D and a pound or two of alloy. But I just read a post on RedUser where someone has been quoted $4400 as the ‘street price’ for the set of three lenses. At that price they make a LOT more sense; hell, misgivings aside, *I* would order a set at that price! You forgot to mention about “focus breathing”. Cine lens should not “breathe” during focus pulling. How about that? Are Xeen lenses truly cine lenses? Focus breathing (for cine lenses) should be given in information tab with scale: microscopic, moderate, huge. Or maybe in %. Do you still intend to post the comparison between these and Canon, Zeiss and Xenon lenses? Haven’t found anything definitive in terms of testing online so very interested to see your results! Hi Matthew, looking to buy some new glass and I’m literally holding my breath for your compassion before making a final decision. Please say it’s coming soon? Robert, soon. I might put out some preliminary results just to give an idea of comparison. Just noticed that Samyang is coming out with a 21mm which would definitely be a nice hole filler between the 16mm and 24mm. It’s a big jump between 16 and 24 and it always surprised me that they didn’t have something in the middle. Hopefully this will be converted to the Xeen line as well. I believe the 21mm you’re referring to is for mirror less systems only. No Canon EF or Arri PL mount. If there are any AC’s lurking it would be good to get a sense of how much the 200 degree rotation is a limitation? I know that more expensive primes rotate more, giving more precise control. Also would the resolution performance be expected to go up when shooting APS-C rather than full frame since it’s the edges of lenses than cause the most problems with performance, true? In my experience, 200 degrees is still good. Usability will also depend on the follow focus, to a degree. Performance would not increase. It would simply be less dan ding when using only the sweet-spot of the lens image circle on APS-C. However, I’ve seen quite a few lenses recently that are designed to produce high MTF numbers. This can be very misleading with a high center and edge MTF, but some resolution falloff in the field. Unfortunately, consumers that love to read into MTF charts don’t consider this and don’t realize that the APS-C edge of a full frame lens can really suffer in terms of resolution. I’ve noticed, on the sales page for the transport case for the Xeen lenses, the following: “the 4-Hole configuration accepts any four Xeen Primes (except for the 135mm) and offers a convenient AKS compartment. The 6-Hole configuration accommodates any Xeen Primes including the 135mm. “. I had thought that Rokinon had only given info on 3 lenses (the 24, 50, and 85) – and the other three focal lengths are unknown and were being released next year… Which makes me think you folks may have a prototype or two in your hands. 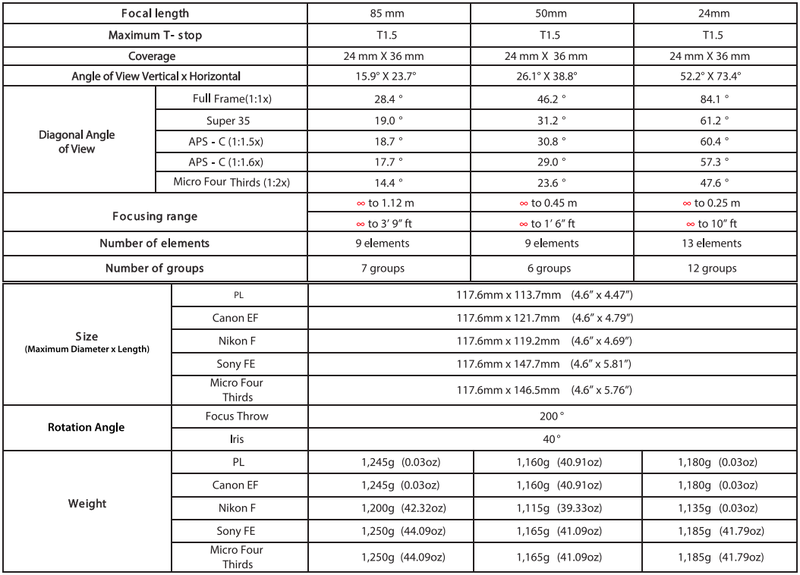 What are the other focal lengths? Same T1.5 as the existing 3 lenses, or different? Hi, Matthew… Back in August, you’d mentioned in this post “So now the question on everyone’s mind – how do these compare to the Zeiss CP.2, the Canon CN-E and the Xenon FF? I’ll have an extensive comparison coming very soon.” It’s almost February, but I haven’t seen your comparison yet. Did I miss it? I don’t see it posted anywhere on your blog. Would really like to see how you compare all four of these sets. Did you decide to drop this comparison? Thanks!